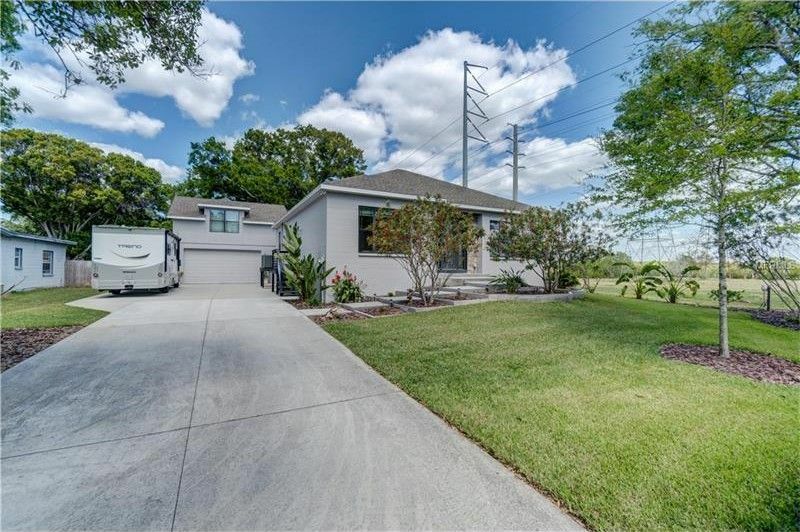 Stunning, contemporary estate located on over a 1/3 of an acre of w/astounding water views of Mobbly Bayou Preserve in the sought after area of Oldsmar ! This architecturally detailed home boasts appointments including a dramatic foyer entry w/travertine floors, modern lighting and etched glass front door, inviting Great room w/deco stained concrete flooring , soaring ceilings, surround system and expansive pkt. sliders leading to the gleaming, sun shelf heated pool w/water fountains and bubblers , travertine decking, spacious lanai w/wood teak ceilings and towering bird cage overlooking the privacy fenced, manicured Landscaped oasis complete with landscape lighting, gourmet eat in kitchen w/ concrete countertops and center island , maple stained cabinetry, stainless steel appliances including 5 burner gas range, hood vent and Bosch dishwasher, Natural gas tankless water heater, immense master bedroom with custom lighting and vast walk in closet w/elevated storage placement, master bath w/ pedestal sink, tile backsplash with mosaics, walk in shower w/extended shower tiles w/ mosaic inserts and rainmaker showerhead, 4th bedroom/game room features Kitchenette, bath w/granite countertop and double sliders overlooking the pool, utility shed (200 sq ft) , oversized 2 car DRIVE THROUGH garage (perfect for your BOAT), keyless entry, abundant driveway for RV parking and more!